I've gone through numerous posts about loading patches and it seems that things have changed since most of them have been made. What is the most up to date approach for this? Added to the preferences/controller section and it seems unable to load it. Just FTR here are my preferences. The file is labelled "counter.axp" and it is in the "Objects" subdirectory of my local folder. So naming the files PATCH_01, PATCH_02 in this case should work? Can I swap the pgm module for a CC driven increment/decrement counter? OK regardless of which approach I take i'm stuck at the "unable to created controller for: " error message. 2) referencing the object directly in the library - this ended up working, not sure what the problem was originally. 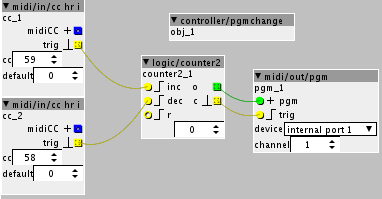 Looks like I will need to find/use a MIDI controller that sends program change messages. Is it not possible to create a custom controller object that will use CC rather than ProgChange? File -> preferences -> controller object. I can't get away from the "unable to created controller for: " error for everything I make. Is there a protocol for saving objects that is different to saving patches? I agree but none of my hardware midi controllers send program change! For now i'll settle for Lemur on the iPad. At least it's highly translatable! they should be saved as sub-patches (axs) , and then also should be in a library. I wasn't saving as a sub-patch! Now I can start to have fun with my Axoloti!